Festo is a multi-national company, with over 22,000 employees worldwide, which develops tailored automation solutions for the process industry, in all project phases from engineering to operation and maintenance. The company exhibited at Flotation '17 for the first time, and now we are pleased to welcome them to Flotation '19, not only as an exhibitor once more, but also as a full time sponsor. We are also pleased to welcome a new media partner for the conference, Minerals, an international peer-reviewed open access journal of natural mineral systems, mineral resources, mining, and mineral processing. Updates on the conference are at #Flotation19. Cornwall is a very special place, not only for its rich nautical and mining history, but also for its spectacular scenery, the coastal path being a paradise for walkers. It is one of the most beautiful counties in England, although many locals say that once you leave Devon and cross the River Tamar you leave England behind! Regular blog readers might be aware of my love for this special place, and those of you who will be attending Computational Modelling '19 and/or Physical Separation '19 in June will have a unique experience, as there is much happening during the conference week. 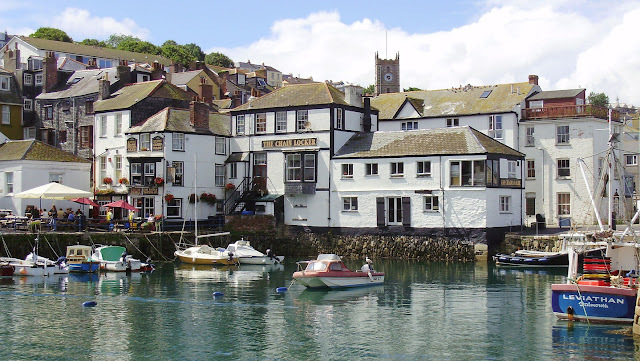 For the first time we will be using a new venue, Falmouth's National Maritime Museum, located by the magnificent natural harbour, and in the centre of what I call 'old Falmouth' where the town's world class restaurants and pubs are located. Only a 5 minute walk from the Museum is the famous 17th century Chain Locker pub, where delegates will be able to sample Cornwall's finest ales after the first day at each conference. This will be after a guided walk along the coast path and around the moat of the 16th century Pendennis Castle, which guarded the River Fal from French and Spanish invasion in Tudor times, long before Falmouth itself became a town. The narrow alley leading to the Chain Locker, typical of many such alleyways leading to the quays, was a dangerous place to be in the 18th and early 19th centuries, as a night on the town could lead to an awakening the next morning with a very sore head, having been 'pressed' into service on a Royal Navy ship by one of the 'press gangs' which lurked in these areas. Cornwall in those times was the world's major producer of copper and tin, and some of the burly men 'pressed' into service would have been miners from the local Gwennap Parish, only 8 miles from Falmouth, and known as the 'richest square mile on earth' due to its high grade copper deposits. Physical Separation '19 delegates will pass through this area on the Friday afternoon, en route to the well-preserved engine houses of Wheal Peevor near Redruth. On returning in the early evening, Falmouth will be coming alive with the annual Sea Shanty Festival, where 66 groups from all over the UK, as well as from Brittany, Holland, Spain, Canada and Ireland will perform their sea songs and shanties in over 20 different venues throughout the town. A good reason to book your accommodation well in advance of the conference week! 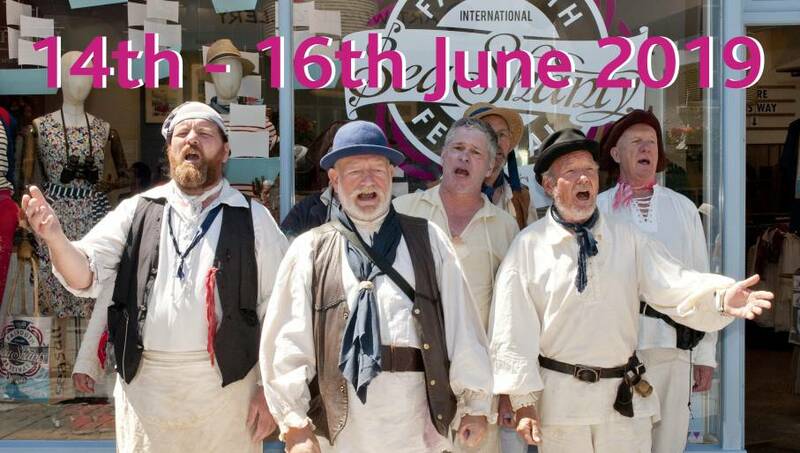 The most well known of the sea shanty groups is Fisherman's Friends, the subject of an eponymous movie, just released, which I would highly recommend that you see, as it will give you a real feel for the atmosphere of Cornwall. The group perform every Friday in the tiny village of Port Isaac, 40 miles from Falmouth by road, but extremely busy in summer. The movie was filmed on location in the village, and lovers of Doc Martin will also recognise it as the fictitious village of Portwenn in the BBC TV series. This section of Cornwall's rugged north coast is a haven for serious hikers, and if you really want a challenge, try the 9 mile walk between Port Isaac and Tintagel, perhaps the most gruelling section of the Cornish coastal path. There are many good reasons to stay on in Falmouth, even if you did not come by car, and on the weekend after the conferences Cornish Lithium Ltd has invited delegates to their Walking with Poldark tours. Coaches will depart from Falmouth, and on Saturday June 15th, there will be a wonderful 6 mile walk on Cornwall’s rugged north coast, in the area near Land's End where most of the mining scenes for the BBC series Poldark were filmed. I am sure that you will leave Cornwall in June with the feeling that you have experienced something very special- the conference programmes are not too bad either! Barbara and I arrived in Turkey in the early hours of this morning. We are near the old city of Antalya, guests of IMCET 2019, the 50th Anniversary of the International Mining Congress and Exhibition, which starts on Tuesday, and ends mid-day Friday. We have been to Turkey many times, this our second visit to Antalya, and my first ever conference was in Bursa in 1984. I am looking forward to an interesting week, with no idea what the conference will be like, or who will be there. But I expect a few surprises, hopefully catching up with friends from the past and present. I will submit daily updates on the week's activities on Twitter. MEI has a very close involvement with the Coalition for Eco-Efficient Comminution (CEEC), which is an Industry Advocate for Physical Separation '19, Comminution '20 and Sustainable Minerals '20, and MEI is a media partner for CEEC. It was great to hear (MEI Online) that our good friend Mike Battersby has been appointed Chair of the CEEC Board of Directors. Mike and his company Maelgwyn Mineral Services have for many years sponsored MEI's flotation conferences, and he has been a regular visitor to Falmouth, his company being based in Cardiff, Wales, which is closer to Falmouth than is London. The CEEC is well known for its comminution energy curves, developed by 2017 MEI Young Person's Award winner Dr. Grant Ballantyne and Prof. Malcolm Powell at Australia's JKMRC. 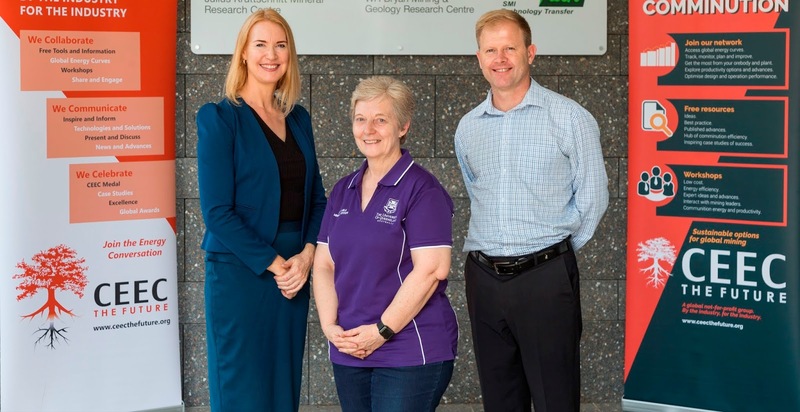 Grant recently moved from academia to Ausenco, and the new team will be led by JKMRC Senior Research Fellow Dr. Cathy Evans (MEI Online). Cathy is one of the three editors of the JKMRC Monograph Process Mineralogy, which was showcased at Process Mineralogy '17 in Cape Town. Cathy is photographed below with CEEC CEO Alison Keogh and JK's Sustainable Minerals Institute Director Neville Plint. It was interesting to hear that a new University in UK is to open next year offering only one degree. The London Interdisciplinary School aims to teach students to solve complex problems which cut across disciplinary boundaries, and to develop a polymathic way of thinking. This is a bold step which acknowledges that these days many academics tend to be highly specialised and unable to take a truly holistic view of their chosen subject. This has become very apparent in mineral processing academia over the last few decades, where the pressure is on academics to pursue research and publications, often at the expense of teaching. At the beginning of last century there was no recognised mineral processing profession. Ores were of high grade and any concentration necessary was undertaken by the miners using simple sorting and gravity techniques. The increasing demand for metals led to the development of flotation, and mineral processing became an acknowledged discipline, but teaching was the primary focus of the main universities, and the teachers were essentially well-rounded mineral processors, such as the legendary Arthur Taggart, the first person to be offered a Chair in Mineral Dressing, in 1919 at the Columbia School of Mines in New York (posting of 6th March 2012). His Handbook of Mineral Dressing is a massive volume, still used today, and I doubt if any mineral processor today would be able to match this in its scope. The recently published SME Mineral Processing Handbook is the modern equivalent of "Taggart" but this is the result of the efforts of a large team of specialists from academia and industry. When I began my 22 year stint at Camborne School of Mines (CSM) in 1974, the majority of the academic staff had been recruited from industry, many like me from the Zambian Copperbelt. Very few had PhDs and there was very little research being undertaken. CSM's reputation had been built on its education of mining engineers by its fine teaching staff. The Royal School of Mines in London did have a world class research reputation, but research was not at the expense of its equally strong commitment to teaching. Things began to change in the late 1980s, and when CSM was merged into the University of Exeter in the early 90s the pressure on academics to research and publish began to build, so I decided in 1996 to opt out and try my luck doing my own thing. 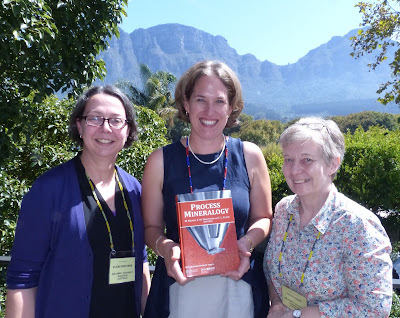 Now it is evident that teaching in many universities is secondary to research, and the pressure to publish for career advancement is enormous. Recruitment of staff from industry is now not the norm, and an increasing number of academics in minerals departments have never seen a mine, let alone worked on one. A typical career path is now postgraduate research leading to a PhD, followed by a junior lectureship, researching and teaching in the same narrow post-graduate field. And my experience editing Minerals Engineering has highlighted that these fields of expertise are becoming ever narrower, flotation for instance now having reviewers who can only assess papers in specialist areas such as flotation physics, sulphide flotation, oxide flotation etc. Reviewers who can assess work on 'general' mineral processing I usually choose from industry. So are today's mineral processing students getting the broad-based education which they deserve and which is necessary in the modern mining industry? As John Starkey pointed out in his comment on the posting of 17th December, there isn't a mineral processing industry. There is a mining industry, and mineral processing is part of it. Also, most mine sites have a mill on the site and very few mills exist that are not on a mine site. The expert mineral processor therefore cannot do his or her job well if he or she does not understand mining, because the concentrator’s feed always comes from a mine. Very few mine General Managers are mineral processors, they are mining engineers, who have a broad knowledge of not only mining, but geology, surveying, mineral economics, mechanical and electrical engineering, as well as mineral processing. I was recruited to Camborne in 1974 to teach mineral processing on the mining degree, but three years later we also started a mineral processing degree. Although it turned out some excellent graduates, it was always difficult to recruit sufficient students to make it viable, and in retrospect I feel that the best route for producing good mineral processors is probably a broad-based degree in mining, followed by an MSc in mineral processing. I would appreciate your views on this? It is good to have Outotec as a sponsor once more of our comminution series of conferences. They are sponsoring for the 4th time since Comminution '14, and now become the 16th company sponsoring next year's Comminution '20 in Cape Town. We are proud to be associated with Outotec, which, at the beginning of 2019, was ranked 12th in the Global 100 Index of the most sustainable companies in the world, being included in the Index for the seventh consecutive year. The giant international company is also a sponsor for Physical Separation '19 in Falmouth, and Flotation '19 in Cape Town. Updates on these events are at #PhysicalSeparation19, #Flotation19 and #Comminution20. Reports are coming in of a strange illness which is affecting a number of people in the Bodmin area of East Cornwall. The symptoms, of loss of energy, insomnia and pallor, are apparently similar to those of acute anaemia, which is usually associated with heavy blood loss. However one theory is that it may be due to release of a pocket of radon gas from one of the many old mine workings in the area. Radon is a chemical element with symbol Rn and atomic number 86. It is a radioactive, colourless, odourless, tasteless gas. It occurs naturally in minute quantities as an intermediate step in the normal radioactive decay chains through which thorium and uranium slowly decay into lead and various other short-lived radioactive elements; radon itself is the immediate decay product of radium. Its most stable isotope, 222Rn, has a half-life of only 3.8 days, making it one of the rarest elements since it decays away so quickly. However, since thorium and uranium are two of the most common radioactive elements on Earth, and they have three isotopes with very long half-lives, in the order of several billions of years, radon will be present on Earth long into the future in spite of its short half-life, as it is continually being generated. The decay of radon produces many other short-lived nuclides known as radon daughters, ending at stable isotopes of lead. Unlike all the other intermediate elements in these decay chains, radon is, under normal conditions, gaseous and easily inhaled and is considered a health hazard. It is often the single largest contributor to an individual's background radiation dose, but due to local differences in geology, the level of the radon-gas hazard differs from location to location. 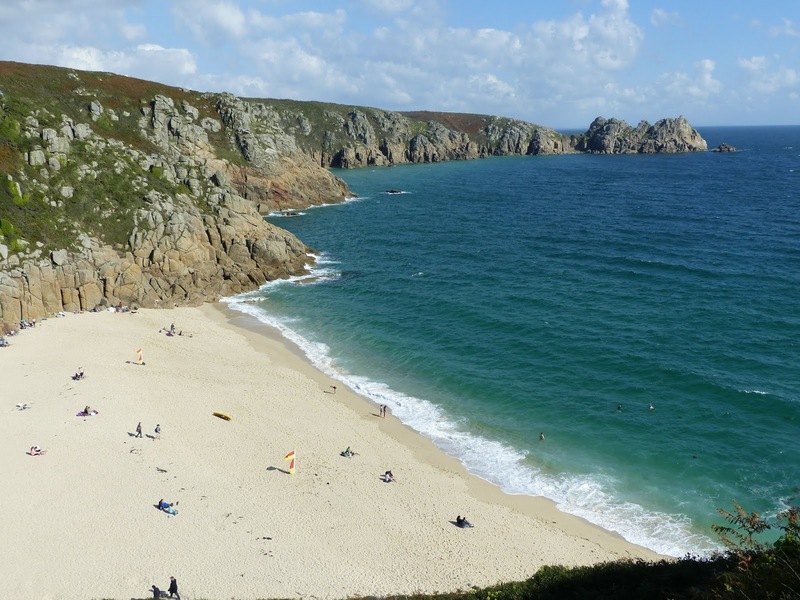 It is known to occur at a relatively high level in parts of Cornwall due to the relatively high amount of uranium in the granite which underlies the whole county at various depths. But could radon gas account for the strange symptoms suddenly manifesting themselves in this locality? I sought the opinion of Dr. Richard Head, the Director of the nearby Bodmin Institute, but unfortunately he was not available. His secretary told me that, since returning from a recent geological trip to the Carpathian Mountains in Romania, he has not been seen during office hours, and has been working in his office through the night on a large soil sample which was delivered in what she described as a long and narrow rectangular box. So I spoke to my brother, Bartholomew, who is back at the Bodmin Institute after a brief spell with MEI. He is as much perplexed by this outbreak as others, but tells me that a specialist consultant from Denmark, Prof. Elvan Singh, who apparently has had experience of similar outbreaks, will be coming over to Cornwall soon to investigate. Meanwhile Bartholomew appeals to anyone reading the blog who might be able to shed light on this very strange occurrence. Around 350 Camborne School of Mines old boys and girls, current students, and a few past and present members of staff attended last night's Camborne School of Mines (CSM) Annual Dinner at the Falmouth Hotel. I'm always amazed at how many of the alumni travel from as far away as Australia to be at this event, a testament to the pride and loyalty that they have for CSM. I wonder if alumni from other great mining schools have the same sense of allegiance? I certainly feel nothing like this for my alma mater, Leeds University. Last night there was a general buzz about the resurgence of the mining industry, particularly regarding the renaissance which is taking place in this great old mining province of Cornwall. The guest speaker was Vancouver-based Richard Williams, CEO of Strongbow's South Crofty Project. He spoke not only of the reopening of the old South Crofty tin mine, but also the great potential of the Redmoor Sn-W-Cu project, and Cornish Lithium's search for lithium in the hot geothermal brines lying deep within and around the Cornish granite (more in the posting of 27th February). Richard highlighted that tin has now become "the glue which holds the hi-tech world together". He is photographed below with Nick Clarke (CSM graduate 1974), and Nick Wilshaw (1980). There are now some dynamic mineral processing companies in Cornwall, and none more so than Nick Wilshaw's rapidly expanding Grinding Solutions Ltd (GSL). Now familiar faces at all MEI Conferences - they are regular sponsors of the comminution series- Managing Director Nick and his wife Flee, a fellow Director of GSL, are actively involved in all areas of mineral processing. In the last few months they have added to an already extensive leaching capability and commissioned a new versatile comminution rig which can be used for a range of tests including the DRA Grindmill Test. Flash flotation and further gravity separation kit are also arriving soon. Nick was recently appointed as a Director of Australian-based Coalition for Eco-Efficient Comminution, an industry advocate for MEI's Comminution '20 conference in Cape Town and the Cornwall-based Physical Separation '19 and Sustainable Minerals '20 conferences. It was also great to see Peter Hackett last night. He was Principal of CSM for most of my 22 years at the School, and he is photographed below with GSL's Flee Wilshaw and past graduate Pete Taylor. As always, a wonderful evening, and many thanks to Chris Kitchen of the CSM Association for outstanding organisation. We are pleased to announce a collaborative initiative with IMFORMED, a UK company providing, like MEI, a source of information, research, and networking events for the industrial minerals business, which includes mineral processing as a major sector. Four years ago Mike O’Driscoll, former Editor, then Global Head of Research, at Industrial Minerals magazine, launched IMFORMED with Ismene Clarke, former Head of Sales at Industrial Minerals magazine. Very much like MEI, IMFORMED also organises international conferences and the collaborative media partnership will actively promote the respective conferences. MEI is currently acting as media partner for IMFORMED's Rendezvous 2019 conference, while IMFORMED is a media partner for Physical Separation '19, Flotation '19 and Comminution '20. We are back in Cornwall after a great week hiking in Switzerland's Jungfrau Region. We have been there a number of times, skiing in winter and hiking in summer, but this was our first time hiking in winter, and ironically it was a lot harder than skiing, which we have given up due to wear and tear! So beautiful is this region that it has inspired me to write a short travelogue for the benefit of blog readers who might wish to visit this area, a jewel in the Swiss Alps, but a very expensive one- expect to pay roughly twice the price you would pay in UK for drinks, meals etc. We made full use of our non-ski passes, which gave us unlimited access to the major cable cars and the superb Wengernalp mountain railway, which runs between the villages of Lauterbrunnen and Grindelwald, via Wengen and the Kleine Scheidegg, a mountain pass between the Lauberhorn and the Eiger. This must surely rank as one of the world's greatest short rail journeys, despite the train being 3 seconds late one day! We were based in Wengen, famous for its views of the 4158m Jungfrau, and for the Lauberhorn, the longest of the World Cup downhill skiing events. If you are into hiking, then these are our favourites of the many routes available, with photos taken last week and also on our summer visits. The cable car in the centre of Wengen (1274m) whisked us up to Mannlichen (2343m) and the start of a wonderful 6km hike to the Kleine Scheidegg (2061m), which took us two and a half hours last week in the snow along the well-groomed walking trail. The mountain views are spectacular, and arriving at Kleine Scheidegg, a cold beer at the 19th century Hotel Bellevue des Alpes, at the foot of the north face of the Eiger, was more than welcome. From Kleine Scheidegg you can travel by an amazing rail journey through a tunnel cut in the early 1900s through the Eiger and Monch to Jungfraujoch, a saddle at 3466 m connecting the highest peaks in the region, the Monch and the Jungfrau. The railway station is the highest in Europe, and it was at Jungfraujoch that I firsted skied, in 1961, during my school's visit to nearby Interlaken. 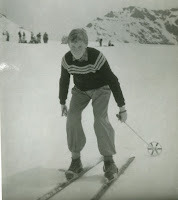 It would be 29 years before I skied again! The first station en route from Kleine Scheidegg to Jungfraujoch, Eigergletscher, is the beginning of the famous Eiger trail, open in the summer months, a moderately difficult 6km hike along the base of the north face of the Eiger. 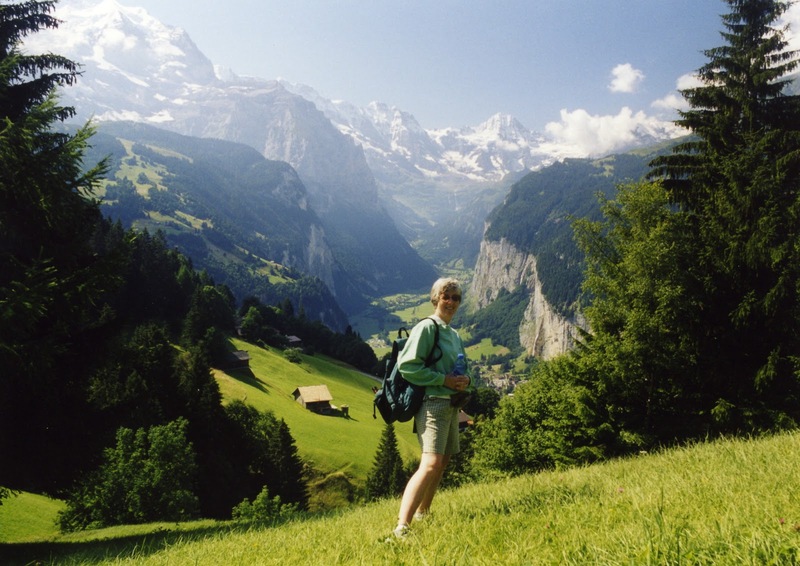 The village of Grindelwald is, at 1034m, the terminus on the train line from Lauterbrunnen. In the summer of 2010 we took the cable car to Pfingstegg, then had a gruelling 2 hour walk to Baregg, with its great views of the rapidly receding Schreckhorn glacier. Last week we took the long gondola ride to First (2167 m), and then the undulating 6km hike to Lake Bachalpsee, an easy walk in summer, but a bit more demanding in the winter snow, especially in the downhill sections. There is little evidence of a lake in winter, but in summer this is one of the most photographed lakes in the alps, with its backdrop of the sharp jagged peaks of the Wetterhorn, Schreckhorn and Finsteraarhorn. From the lake the path leads to the Faulhorn (2681m) and then on to Schynige Platte. Unfortunately the 16km trail from First to Schynige Platte, one of the great alpine hikes, is only open in summer as the cog railway from Schynige Platte down to Wilderswil does not operate in winter. The cogs on the cog railway really come into play on the steep descent from Wengen to the little village of Lauterbrunnen, but when snow free there is also an easy 1km walk down to the village. The Lauterbrunnen Valley is a geologists dream. Thick beds of Jurassic limestone were deposited as calcareous mud around 140 million years ago, and the Alps began to form about 35 million years ago, when the African tectonic plate forced its way into the more stable tectonic plates of Europe and Asia. These mighty tectonic forces twisted and contorted the rocks, which have been exposed in the steep walls of the valley, which were carved out by glacial action during the last ice age. 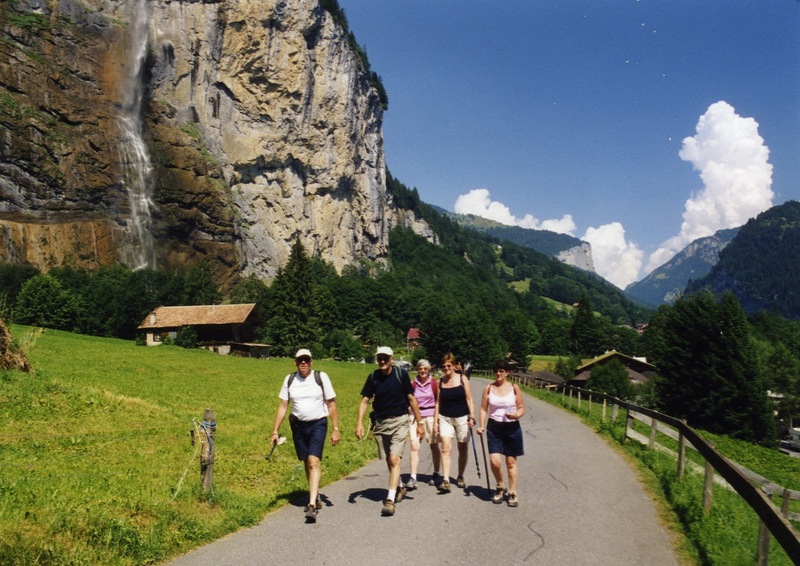 The walk through the valley to the Trummelbach falls is an easy 3km in summer and winter. It is a valley of 72 waterfalls, falling from the 450m walls, the most famous being the Trummelbach Falls, which are fed by glacial waterfalls inside the mountain. The Trummelbach drains the glaciers of the Eiger, Monch and Jungfrau mountains and carries 20,200 tonnes of eroded sediment per year. Trummelbach is a series of ten waterfalls inside the mountain made accessible by a tunnel-funicular and stairs, built 1913, which is open only in the summer months. Just opposite Lauterbrunnen station is the cable car up to Grutschalp, which is 6.5 km from Murren, either by a regular mountain train, or via an easy walking trail affording spectacular views of the Eiger, Monch and Jungfrau. The tiny village of Murren is within touching distance of the Jungfrau, but is famous for being at the foot of the Schilthorn (2970m), the location for the 1969 James Bond film On Her Majesty's Secret Service. If you are a Bond fan then you may wish to join the long queues for the two cable cars which take you up to the summit, and Piz Gloria, the revolving restaurant which, during its construction in 1968 was used as the HQ of the evil SPECTRE organisation in the movie. Apart from the spectacular views there is also an exhibition of the making of the movie, and the impact that it had on the small Murren community. The town of Interlaken is the gateway to the Jungfrau region, and it is worth spending a few hours in this town of elegant Victorian hotels, situated between two large lakes, Thun to the west and Brienz in the east. On our final afternoon last Friday, we took the train from Lauterbrunnen to Interlaken Ost, and then strolled along the bank of the River Aare, which separates the two lakes. And then back to Wengen to enjoy the last view of sunset on the Jungfrau. In summary, although the winter hiking is good it does not compare with that in summer, where there are more options available, such as walking down wide alpine meadows, many of which are winter ski runs. 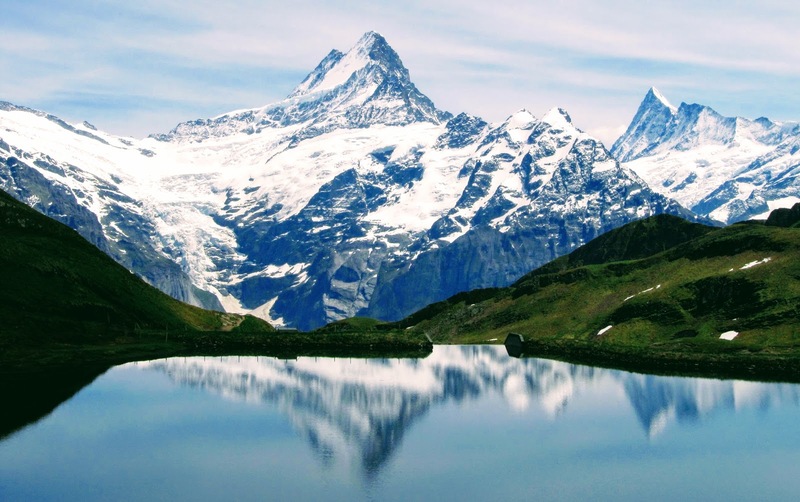 So for any MEI Conference delegate wishing to do something special in Europe after, hopefully, spending some time in Cornwall, I would thoroughly recommend June or July in Switzerland's Jungfrau region of the Bernese Oberland. There are many tour operators who can help you travel to the region. We chose the excellent Inghams. We travelled by train from Falmouth to Bristol (Temple Meads) and flew from Bristol to Geneva, where the Inghams coach transferred us to Lauterbrunnen, and the short train journey to Wengen. Our accommodation in Wengen was at the impressive Beauside Park Hotel, looking down on the village and the backdrop of the Jungfrau. Returning to Bristol, the train to Taunton will take you to the main line back to London. If this posting persuades you to visit this wonderful German speaking area of Switzerland, please share your experiences via comments on this posting. Enjoy your visit. I'm sure you will.